A World War Two submarine action film with a touch of romance, Operation Pacific ticks all the boxes but does not shine in any of them. In World War Two, the American submarine Thunderfish is tasked with tracking down and sinking Japanese enemy vessels in the Pacific Ocean. 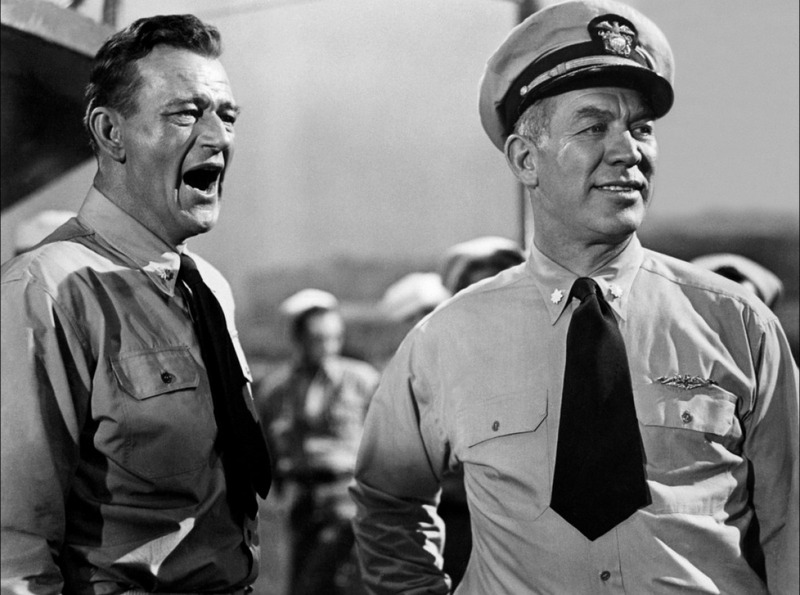 Captain "Pop" Perry (Ward Bond) and his Executive Officer "Duke" Gifford (John Wayne) are friends and smoothly command the sub. 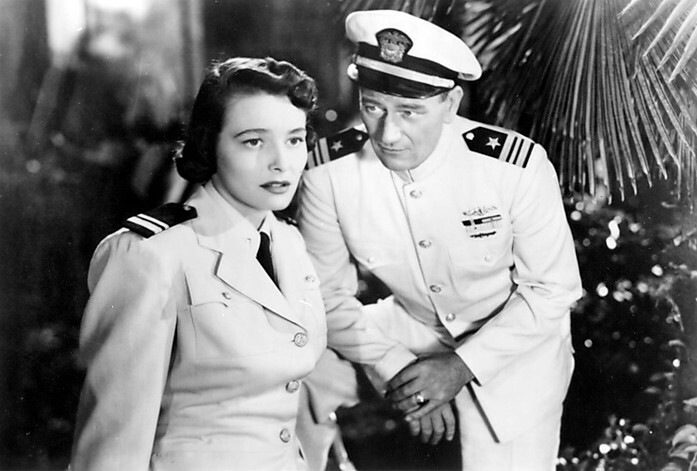 After rescuing civilians from a Japanese held island, Thunderfish returns to Pearl Harbor where Duke hopes to win back the love of his ex-wife Lieutenant Navy Nurse Mary Stuart (Patricia Neal). However, she is now in a romantic relationship with Pop's younger brother Lieutenant Bob Perry (Philip Carey). Back at sea Thunderfish tangles with more enemy ships, but is hampered by faulty torpedoes. 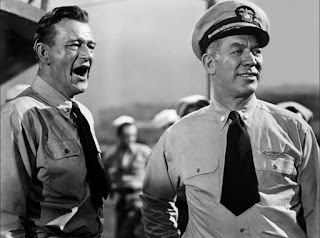 Pop and Duke have to lead their men into a difficult encounter with a heavily armed Japanese freighter, and the outcome further complicates the tense relationship between Duke and Bob. But the Thunderfish's biggest challenge still lies ahead. Written and directed by George Waggner, Operation Pacific is inspired by true incidents that occurred in the Pacific theatre during World War Two. The film is committed to an investment in a close-to-realistic portrayal of submarine warfare operations, and the scenes at sea carry the requisite edge as men in confined surroundings dispatch death in the form of torpedoes and in return anticipate the juddering thuds of depth charges. The subplot about malfunctioning torpedoes introduces an unusual but welcome dose of engineering pragmatism in a war movie. But in terms of characters and narrative engagement, the film sails in firmly bland territory. The Duke character is fully subsumed by John Wayne to the extent of sharing the actors' nickname. And Wayne treats the submarine as his horse as he rides tall in command, fearless in every decision and never harboring any doubt that he will win the war and win the girl. The absence of depth exposes the film to the silliness of a romantic triangle where Mary Stuart clearly shares no affection with Bob and whether consciously or not is using him to win back Duke. Wayne and Patricia Neal do click as an on-screen couple (despite apparent off-screen apathy), but Duke's damn-the-torpedoes approach strips the film of subtlety both at sea and on land. Waggner does alternate between action and romance at regular intervals and avoids lingering for too long in any one place. The film clocks in at under two hours, and Waggner finds a good ending in a large scale naval battle with plenty of opportunities for heroism and sacrifice. The love and war stories finally merge on the high seas, Wayne presented an efficient opportunity to dominate both arenas. And wet or dry, it's pointless to expect anything other than a comprehensive Duke triumph.